Taste of Nepal tour package is the tour in which tourist can taste all kinds of activities and adventures found in Nepal. Tourist can taste the different culture and tradition in a small area. Nepal we have many different ethnic groups and all of them have the own culture, tradition, festivals, foods and clothing’s. Nepal has many cultural and adventure trips. So tourist can taste all the activities in this tour. In taste of Nepal tour we offer, culture tour in Kathmandu, Rafting in Trishuli River, boating in Pokhara with view of beautiful natural beauties and wild life adventure in chitwan National park. Small trekking and hiking around Kathmandu valley also included. Day 01: Pick up from Kathmandu international airport by our tour guide and transfer to the hotel. 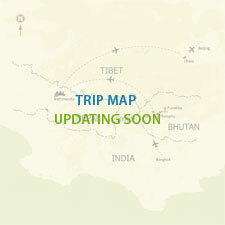 Day 02: Drive to domestic airport for one hour mountain flight to approach close to the Mount Everest. Then drive back to hotel and have breakfast. After breakfast tour starts to the Kathmandu durbar Square to see the old Royal palace with groups of pagoda temples. Then drive to Bouddhanath stupa which is the one of the biggest stupa in the world. Shakyepa and Ningmapa monastery are also worth to visit and have lunch on the roof top restaurant with the view of the stupa. After sightseeing drive back to hotel. Day 03: After breakfast at 9:00 am starts tour to patan a city of the fine arts. In Patan tourist can view the art and architecture of royal palace. Buffalo intestine is hanging on the main entrance gate of the royal palace to drive away all kinds of bad evils from the royal palace. Krishna temple, Narayan temple and golden temple are the measure attraction of the Patan city. Then drive to Bhaktapur one of the best cultural city in Kathmandu valley. The fifty five windows royal palace, barking bell, golden gate, and royal bath with numbers of other temples are really worth to see. Lunch is provided in Bhaktapur. The pottery square, Nyatpole temple and Dattatraya temples are also very important in Bhaktapur. Then drive back to hotel. Day 04: Breakfast and at 9:00 am starts tour to swyambhunath which lies on the top of the hill and one of the very beautiful stupa in the Kathmandu. Then drive to pashupatinath temple which lies on the bank of Bagmati River. Pashupatinath temple is the one of the most important religious site for all hindu from the world. Pashupatinath Temple belongs with hindu supreme god shiva. In the same area tourist can observe the cremation. Then lunch is provided and drive back to hotel. Day 05: Drive to Bandipur a hill top small town. On the way we do three hours rafting in Trishuli river and drive to Bandipur. Look around the Bandipur town. Day 06: Drive to Pokhara and same day we can do boating on Phewa Lake. Day 08: After breakfast drive to chitwan national park. Day 09: All activities in chitwan national park. Day 10: Drive back to Nagarkot. Day 11: Trekking from Nagarkot to chisapani. Day 12: Trekking from Chisapani to sundarijal and drive back to Kathmandu hotel. At evening farewell dinner is provided with cultural music dance. Pick up and drop transport as mentioned in the itinerary. International air ticket, airport tax and Nepal visa fees. All kinds of drink during tour and travel with us. All kinds of cloth and personal belongings.